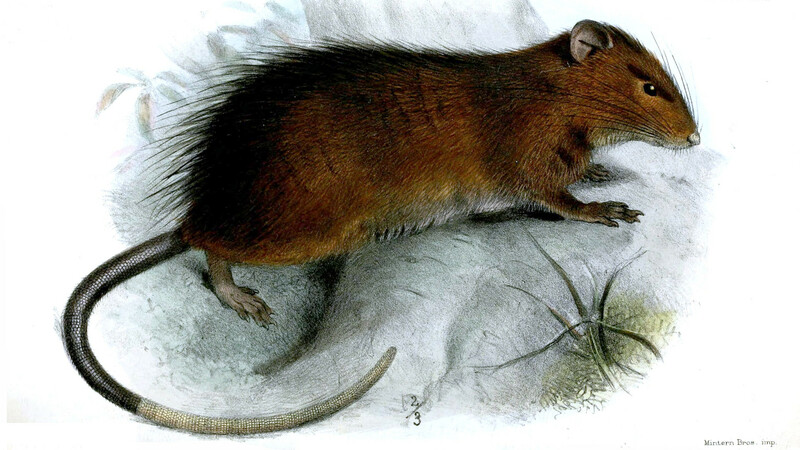 An 1887 painting of Maclear’s rat by Joseph Smit. Public domain. When Western sailors first landed on the uninhabited volcanic outcropping in the Indian Ocean that would later become known as Christmas Island, they found it abounding with unique and interesting species that had evolved over thousands of years in isolation. At that time one of the most plentiful Christmas Island species was a nearly two-foot-long rodent. Eventually dubbed Maclear’s rat (Rattus macleari), the island’s dominant mammal exhibited little to no anxiety about the sudden presence of humans. Perhaps these bold rats should have realized they had something to fear when two-legged residents first showed up on their island home. By 1903, just three years after Andrews’ monograph was released, Maclear’s rat was extinct — probably due to a disease carried to the island by invasive black rats (Rattus rattus) that had stowed away on visitors’ ships. 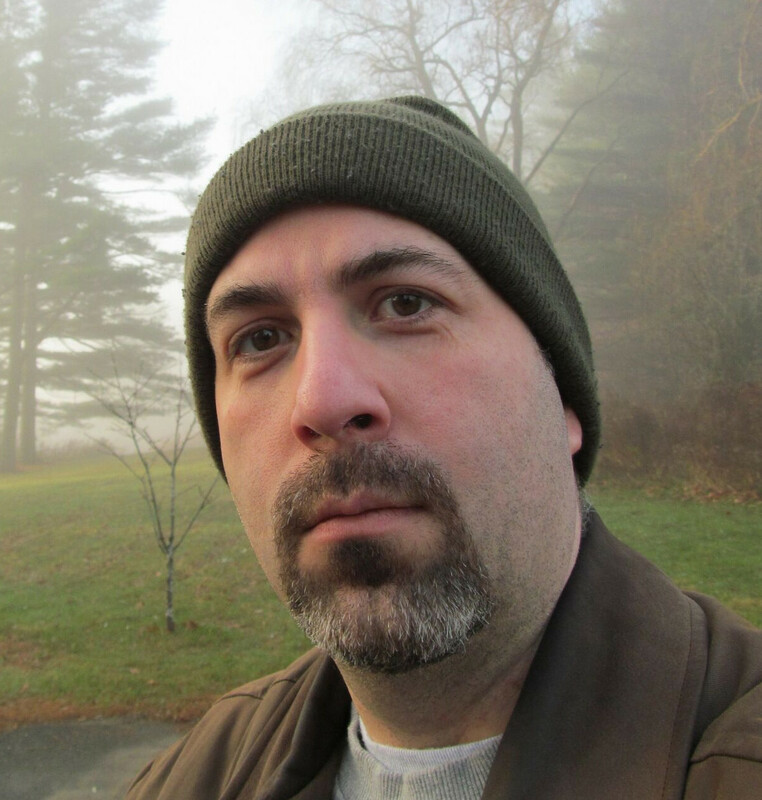 Now, 115 years later, we know that Maclear’s rat was not alone in its fate. According to a paper published August 13 in the Journal of Insect Conservation, the disappearance of the rat also caused the extinction of another species that depended on it: a parasite called the Christmas Island flea (Xenopsylla nesiotes). 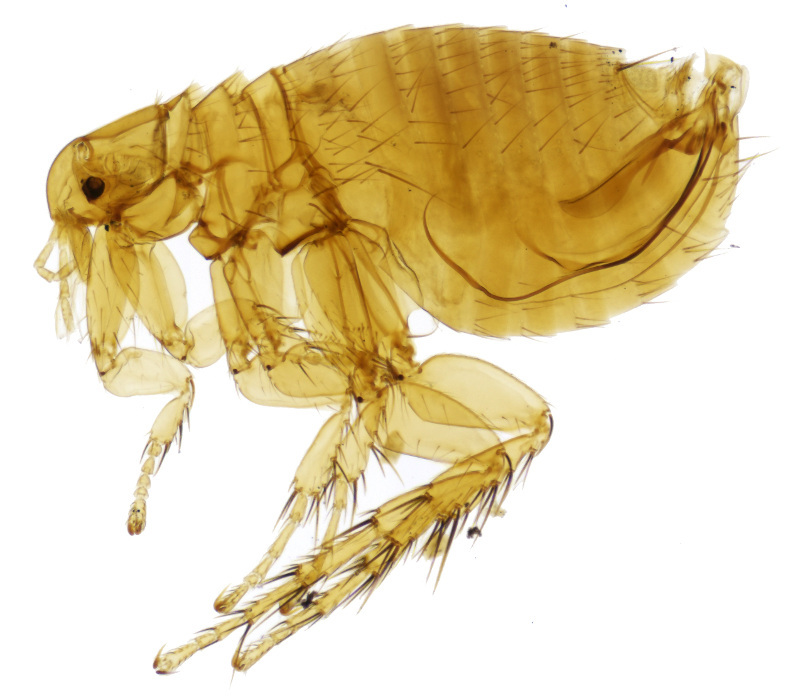 This is the first time that a host-specific flea has been declared extinct, according to the paper. A relative of the extinct Christmas Island flea, courtesy of Mackenzie Kwak. The discovery of the extinction was saddening, but not surprising, says the paper’s author, Mackenzie Kwak, a parasitologist with the National University of Singapore. “Parasites, particularly the host-specific species, are perhaps the most imperiled group of organisms on Earth,” he says. Kwak, whose research focuses on assessing parasites’ extinction risk, has also documented other flea species of Australia, of which Christmas Island is now a territory. He found that four other species are endangered, two of them critically. All are host-specific fleas that parasitize one species each. As he explains in his paper, specialized parasites are at the mercy of their host species, which actually makes them more prone to extinction than their hosts. He’s dubbed this the “cryptic loss effect.” If a theoretical possum species were living in four populations — only two of which carried host-specific fleas — and the two flea-carrying populations disappeared, the possum species as a whole could survive. The flea would not. In fact, the loss of one host species could actually affect numerous species around it. “Many species host a huge range of parasites, so the extinction of one bird can have a cascade effect of also causing a handful of host-specific parasites to disappear as well,” Kwak says. Maclear’s rat is an example of that. Another parasite it once carried, a tick called Ixodes nitens, is also believed to be extinct. Kwak says this cryptic loss effect means many parasite species are at risk of extinction, even if they are not currently recognized as such. “For every threatened vertebrate species listed on IUCN Red List, there is a number of unrecognized co-threatened parasites waiting to go extinct should their host decline,” he says. To help prevent this, Kwak’s paper calls for a more holistic approach to conservation, with fleas and other parasites considered just as important to save as their host species. This might involve conservation efforts in the wild, translocating threatened populations to safer sites, or even captive breeding. The idea of conserving wild species and their parasites is “something of a paradigm shift,” says Kwak. “At present conservationists are only concerned with eradicating wildlife parasites, even though host-specific parasites generally don’t adversely affect their host species. This shortsighted notion gives no thought to the value of parasites as wider biodiversity or big players in ecosystem functioning.” He says it has even led to at least one species — the Californian condor louse (Colpocephalum californici) — being purposefully driven extinct. “To have conservationists invested in conserving all threatened species, rather than some species, while causing the deliberate extinction of others, would be a welcome change,” he says. Why should we worry about conserving parasites? It turns out that despite the negative connotations of the word, most parasites don’t kill their hosts, and they play some important roles. “We certainly know that parasites play key roles in food chains, nutrient cycling and in helping their host’s immune system stay strong and effective, so they have so-called ecological value,” Kwak says. Of course, all of this is a century too late for the Christmas Island flea. But maybe it serves as a bit of a wakeup call — however itchy — for other imperiled parasites. Some of them may be disappearing right now, while nobody is looking.